The flavor and shape kids and adult love! 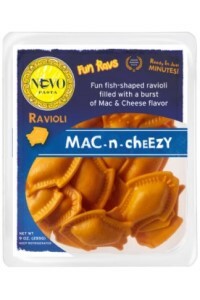 Ravioli that bursts of real macaroni and cheese flavor, shaped in the oh so familiar fish shape. They are packed in 9-oz atmosphere controlled packages. Cook in 4 quarts of salted boiling water for 3 minutes or until desired tenderness. Drain, toss with your favorite sauce and serve. Ingredients:Filling: ricotta cheese (pasteurized whey, whole milk, cream, vinegar, salt), cheese powder (dehydrated blend of whey, cheese (granular and cheddar (pasteurized milk, cheese culture, salt, enzymes)), buttermilk solids, whey protein concentrate, salt), mozzarella, milk, egg whites, paprika oil, turmeric oil, annato oil. Pasta: durum flour, water, eggs, turmeric oil, paprika oil.